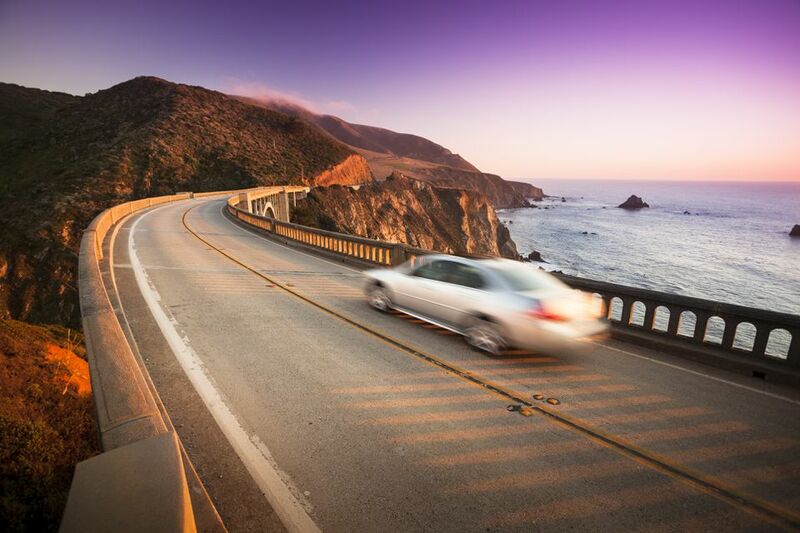 There are plenty of ways to get from Los Angeles to San Francisco. Let's explore options for traveling by car, bus, train, or airplane. Daylight varies by season from 10 hours in December-January to 15 hours in June-July. The fastest way to get there, but b-o-r-i-n-g.
Leave Los Angeles on I-405 north to CA Hwy 14, then connect to US Hwy 395 north. Follow it up the eastern side of the Sierras to Lee Vining and Mono Lake. When Tioga Pass is open, cross Yosemite National Park and head west to San Francisco. If Tioga Pass is closed, going north to Lake Tahoe and then to San Francisco on I-80 is an alternative. Travel time: Flight time is a little more than 1 hour, but allow another 1.5 to 2 hours to get to the airport early enough and to collect baggage when you arrive. You won't be surprised to find that airline flights between LA and San Francisco are faster than taking the train or bus, but the small price difference may be unexpected. If you shop around for cheap tickets and buy them at least two weeks ahead of time, you'll only pay a little more for that flight than you would for a bus or train - and when gasoline gets expensive, a solo traveler may find it cheaper to take that flight than to drive. Southwest Airlines operates between Los Angeles are airports LAX, Burbank, Ontario, or Orange County and in the Bay Area, San Francisco, Oakland, or San Jose. We love their policies - no extra fee for checked bags and no change fees. They don't participate in online travel sites, so you should always check directly with their website, where you may also find hotel and airfare packages that can make planning a snap. Jet Blue Airways flies from San Francisco to Long Beach and often offer the lowest fares between the two areas you'll find anywhere - and your first bag flies for free. For all other airlines, you can compare cheap ticket fares using any airfare comparison site. Los Angeles metro area airport codes are LAX, BUR (Burbank), LGB (Long Beach), and SNA (Orange County). San Francisco is SFO, Oakland OAK, and San Jose SJC. People often ask about how they can get from Los Angeles to San Francisco (or vice versa) without renting a car and driving. Below is a roundup of the ways you can do it by bus or train. Megabus runs from Los Angeles Union Station to the San Francisco CalTrain station (which is downtown), with seats sometimes as cheap as $1 if you reserve well in advance (but more often more than that). The trip takes about 7.4 hours. A convenient Shuttle Bus runs between Monterey Park (east of downtown LA) and San Jose, Cupertino, San Francisco or Oakland. There's only one trip offered a day, leaving in the morning from each place. 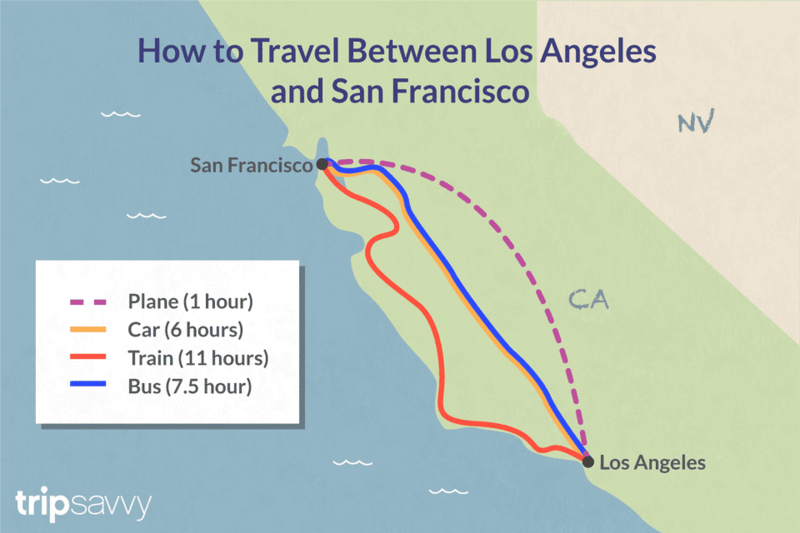 It takes about 8.5 hours to travel between Monterey Park and downtown San Francisco. California Shuttle Bus picks up and drops off at several locations on both ends of the route, departing at noon and midnight only and taking about 7.5 hours. You'll get better rates if you book in advance. Flixbus offers bus service between Los Angeles and San Francisco. On the LA end, they stop in five locations, including some on the Westside. In Northern California, you can go to San Jose, Berkeley, Oakland, Fremont and San Francisco (Townsend Street near the CalTrain station). The high-speed rail system you may have heard about between San Diego and San Francisco is unlikely to ever happen, according to California Governor Gavin Newsom who said in his 2019 State of the Address “Right now there simply isn’t a path to get from Sacramento to San Diego—let alone from San Francisco to LA,” but you can make the trip on a regular Amtrak train. The Amtrak Coast Starlight line runs from Los Angeles' Union Station to San Jose or to Oakland's Jack London Square but does not go to the city of San Francisco. However, they do offer train/bus combinations that can get you there. The Amtrak trip from LA to Oakland takes a little more than 11 hours. Some of their options include long rides on a bus (look for the little bus icon) and in some cases, you'll have to change conveyances twice to reach your destination. You can also take an Amtrak train to San Jose, where you can transfer to Caltrain to get to San Francisco.